Shatayu College of professional studies connects students with business education world academic. 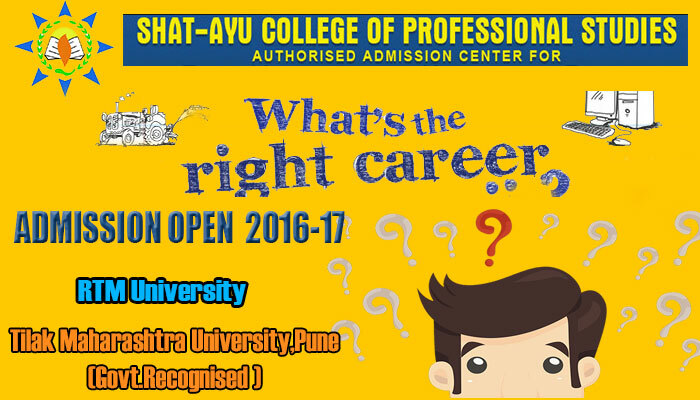 Direct offering specific program from ‘Tilak Maharashtra University” Pune for students whose main target is to enhance management practices. Training, Special Sessions, Exchange of experience, live seminars which help students to get practical knowledge as per corporates and industrial need. So that student get trained to make career after education in corporates and new market.it become easier to find waiter candidate are job seeker or looking for career change or rejoining the job. We offer a wide range of programs, services and resources which can support you along the way. Shatayu college trained to students how can you predict and prepare for the work culture in future? What should you be doing now to make sure you don't find yourself facing a dead end in your career, with no opportunity to change direction without crashing? You need to develop the transferable skills that are universally sought by employers. Leadership, communication, innovation, stress management and interpersonal skills are all fundamental requirements of the jobs of today and tomorrow. Students need to develop business skills and technology which help them to secure their job and may open door to working in new industry. Whether ambitious students or studious candidates we make everyone to grow and reflect new ideas. shatayu college of Professional studies offer management of international studies by providing student-friendly atmosphere and the course have a distinct advantage of approach, designed to suit the needs of aspiring employees and the industry in the close vicinity. We inspired a privilege for me to be in a position to impart Good and Healthy Education to the citizen students of my beloved country. The ninth generation of any country is considered to be the pillars of the pillars of the nation. We make it a point that these students emerge out strong and skilled for the betterment of the society and upliftment of our country. Education is considered to be the backbone of one’s country. It is through education that a person understands the difference between what is right and what is wrong. It is about taking prompt and appropriate decisions for the welfare of society. Shat-Ayu lays an equal emphasis on extra-curricular activities. A number of guest lectures, seminars, workshops on personality development by eminent personalities from industries and Academics are also arranged in order to keep students updated with knowledge and development in the fields. Shat-Ayu offers free admission to the students who come under the category of backward classes. 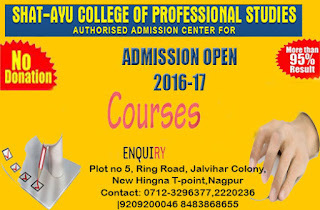 Shat-Ayu is the most forward looking educational institute of the city. Management of International Studies-Shatayu college, Nagpur offered various types of courses by different different recognized by Government of Maharashtra University. A college which gives personal care to each students having experienced teaching faculty. We inspired a privilege for me to be in a position to impart Good and Healthy Education to the citizen students of my beloved country. The ninth generation of any country is considered to be the pillars of the pillars of the nation. We make it a point that these students emerge out strong and skilled for the betterment of the society and upliftment of our country. Education is considered to be the backbone of one’s country. It is through education that a person understands the difference between what is right and what is wrong. It is about taking prompt and appropriate decisions for the welfare of society. CA Bachelor of Computer Application.